I visited Houston again earlier this month. With multiple appearances and big names on the same day, I couldn’t pass up the opportunity to meet Williams, and JJ Watt at the same location. Whataburger was again hosting the Community Player of the Month event, and after getting lost on Highway 6 N as opposed to Highway 6 S, I was able to find the correct location. Arriving a bit before 2pm, I saddled up to a group around front and talked to them. As I did the community relations team of the Texans came out and strapped wristbands on us. I was #14, but there was probably close to 100 people there. When the event began, they quickly ran out of wristbands and then gave the next 15 stand by cards, and turned the excess out above that away. There was greater than 250 people there for autographs, and while Mario was accommodating, his introverted and shy nature especially when dealing with the giant crowd came off as dismissive. When he signed my card I asked him what his tattoo was on his hand, to which he bashfully replied that it was a football. 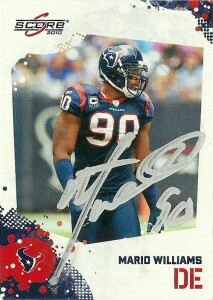 With the Texans drafting of JJ Watt, Mario Williams immediately became the largest outside linebacker in the league. Combining a devastating upfield bull rush with a 2 point stance, Mario was off to a fast start in 2011, much to the dismay of pundits and the media who hoped for his failure. While he was learning the job on the fly, Mario made 5 sacks, 11 tackles, 1 forced fumble and a pass defensed before tearing his pectoral muscle, ending his season after only 5 games. Going into a contract year for 2012, it is thought that the Texans may franchise Williams at OLB, effectively dropping his salary from its high perch among defensive ends, or allow him to test the free agent waters with the emergence of young LB Brooks Reed. UPDATE: 8/27/12 As theorized the Texans did indeed allow Williams to test the free agent waters where he signed with the Buffalo Bills and a $100 million dollar contract. Mario Williams- The #1 overall pick of the 2006 draft was met with a lot of groans and guffaws when Mario took the stage that year, and the Houston Texans were labeled as fools for not taking either USC runningback Reggie Bush or hometown quarterback Vince Young. Much of the pundits were in shock over the selection made by the team, because the knock on Williams was that he took a play off now and then. At 6’7″, 295, he ran a pedestrian 4.66 40, but impressed the Texans’ staff with his strength and work ethic. 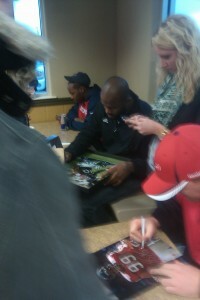 The fans were split, wanting hometown and University of Texas star Vince Young or electric offensive dynamo Reggie Bush. Mario Williams was not on anybody’s radar. The Texans insisted that he was their guy because they wanted a full-time player, and the team already had a quarterback at the time (David Carr). (In addition, it did not help that when it came down to financial negotiations, it was rumored that Reggie Bush’s camp floated a high number and refused to budge.) There would be severe fallout from the pick and Mario would be roundly criticized. New Orleans would draft Bush and Young would go to the turncoat Titans. The Texans would circle their wagons and shelter their #1 selection from the criticism while cranking up the public relations machine. Because of a plantars facitis, Mario’s rookie season was not considered a good one, however in 2007 he went out and proved the league wrong, when he singlehandedly crushed the Denver Broncos in primetime. He’d dominate teams running at full speed and make 14 sacks that season, following up in 2008 with 12 more. Williams 2009 and 10 seasons have not been as super, with injuries piling up and a nagging groin injury. Regardless Williams has still managed to make 17.5 sacks over those two seasons. Critics however, have pointed to the sacks coming in ‘garbage time’, which is an unfair assessment due to Williams being frequently double teamed. In the short time that he has been with the young Texans’ franchise, Mario has already established himself as the franchise’s all time sack leader and holds the single season record with the 14 sack effort he had in 2007. Unfortunately Williams will always have to live up to the comparisons made between him,Vince Young, and Reggie Bush- all playmakers in their own right, but the overwhelming scrutiny will always be there, even though Williams is a 3 time Pro Bowler and 2 time AP. With many members of the 2006 draft now switching teams or under tremendous scrutiny, Mario has endured and continued to perform under the constant stress of being the overall #1 pick of the draft. As the Texans transform their defense to a 3-4 alignment after the 2011 draft, new coordinator Wade Phillips has confirmed that he will move Mario around the line of scrimmage and perhaps utilize him in a 2 point stance, drawing comparisons to the changes Phillips installed in Buffalo transforming Bruce Smith into a 3-4 defensive end.